This is a 5-night, 6-day workshop. Your adventure begins at 10 a.m. on October 13 and ends after a final slideshow on the afternoon of October 18. As with all National Parks at Night Passport Series workshops, we will teach at this location only once. 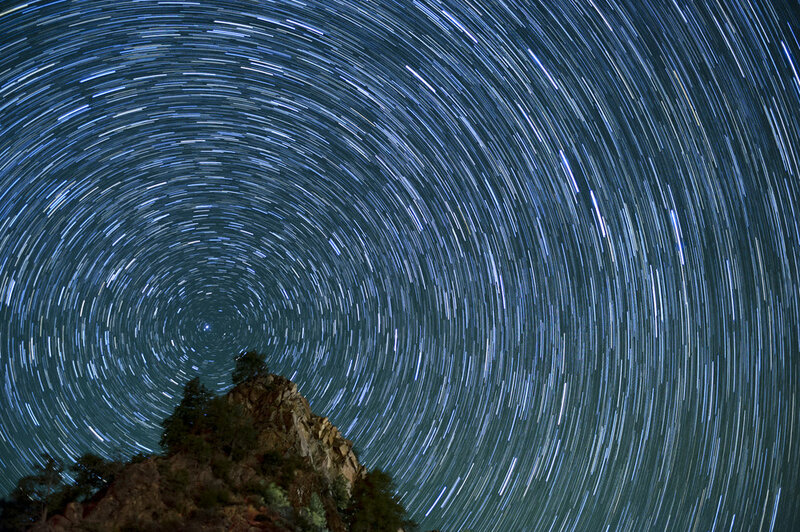 If you have a dream of making epic long exposures at night at Big Bend National Park, we hope you join us. 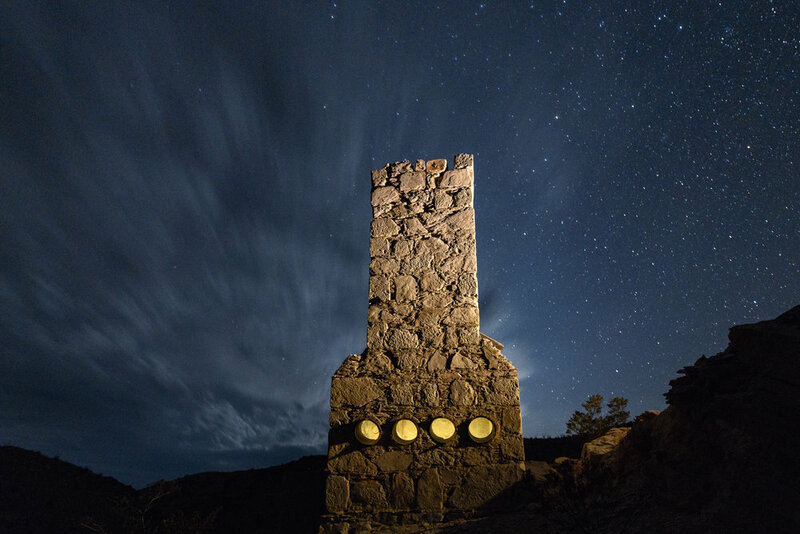 We invite you to spend an evening right before the workshop to explore and photograph an amazing abandoned mining site in the backcountry south of the Chisos Mountains. $650 + applicable taxes. Meal not included. After registering for the main workshop, you will receive a link to optionally register for this post-workshop trip. First come, first-served. Intermediate. 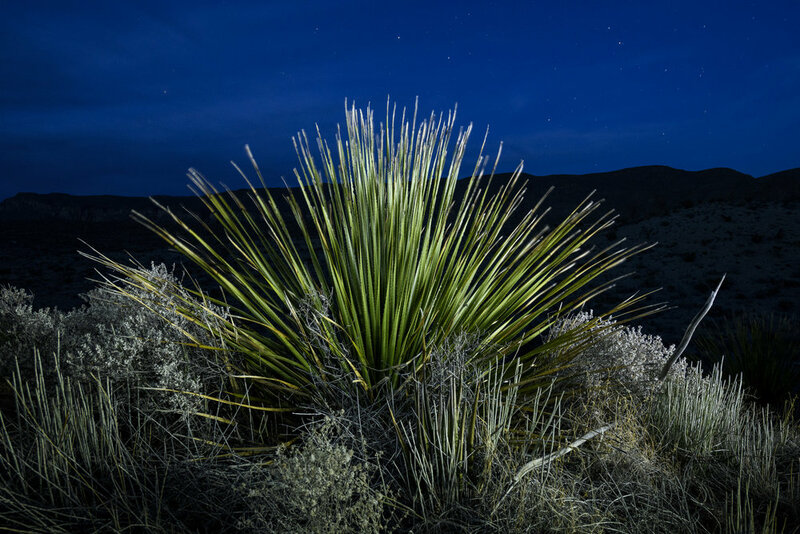 Attendees should have a comfortable understanding of the basic techniques and principles of night photography. Balance of $1,250 due on July 15, 2019. Last day for a cancellation request is July 14 (see cancellation and refund policy). 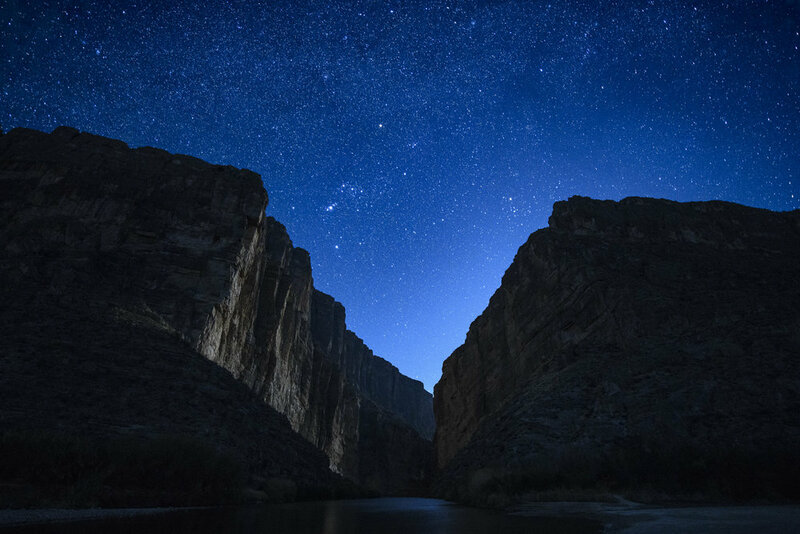 Big Bend National Park sits under some of the darkest skies in North America. 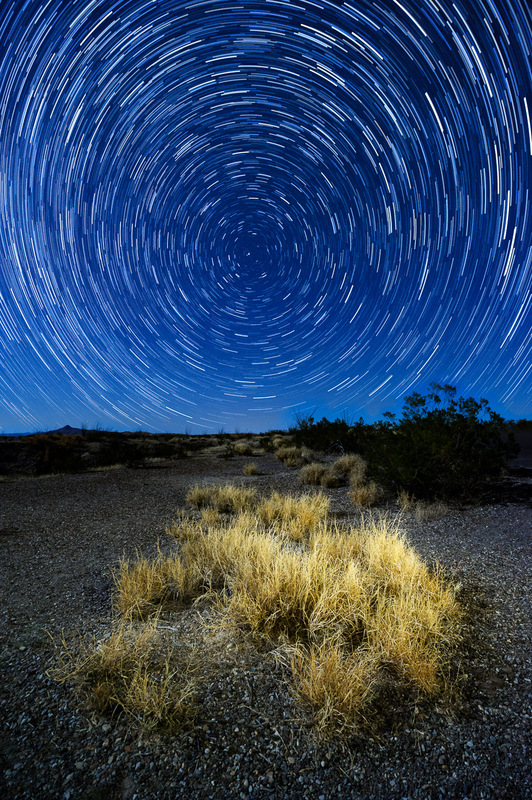 In fact, it’s one of only four national parks in the U.S. that has night skies designated as gold-tier by the International Dark Sky Association. So, there aren’t too many places that can compare in terms of where to get down with some nocturnal photography! We will explore the many photo subjects the park has to offer. Desert landscapes. Rock formations. Mountains. Canyons. Cacti. Ruins. We will photograph then under moonlight early in the week, then under dark skies later in the week. We’ll work at some of the park’s iconic locations, as well as at some off-the-beaten path spots along dusty dirt roads. 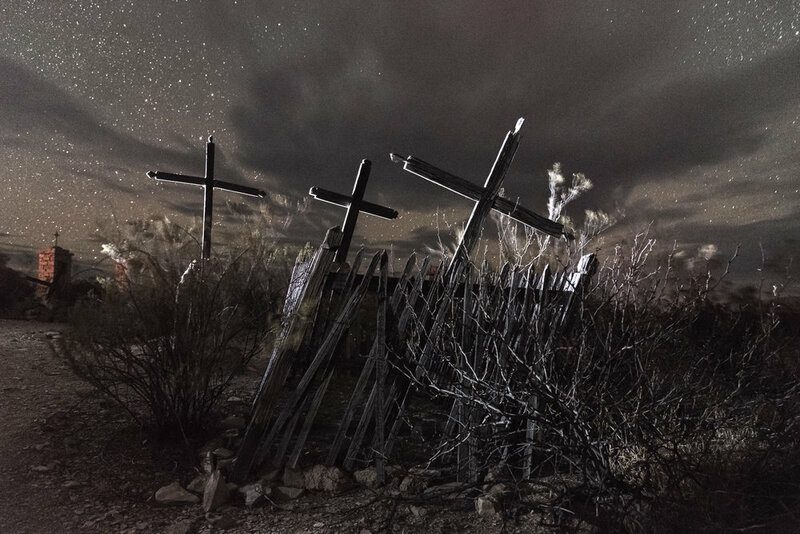 And our lodging is close to Terlingua, giving us access to its ghost town and amazing old cemetery. Throughout the week we will explore and photograph an amazing, quite landscape that’s worth every mile traveled to get there. In the remote reaches of Big Bend, south of the Chisos Mountains, sits lonely Mariscal Mine. Abandoned in the 1940s, the site was used to pull quicksilver (i.e., mercury) from the desert underground. The mine accounted for one-quarter of the mercury produced in the U.S. from 1900 to 1943. Now the mine stands staid in the desert, waiting for us to come photograph it. We’ll drive the primitive roads into the Big Bend backcountry, navigating through rock formations and skimming the edge of the Rio Grande, to get to Mariscal. We’ll set up camp, scout in daylight, eat dinner, and then go shooting. Shoot what? The site contains more than a dozen ruins, including houses, holding bins, the furnace, condensing chambers and mine shafts. There’s also the desert landscape, with the Chisos Mountains to the north and the Sierra Del Carmen mountains on the eastern horizon. When you’re done shooting, roll into your sleeping bag. We’ll wake in the morning (for sunrise, perhaps?) and head to Study Butte to check in to the casitas to get ready for the main portion of the workshop. 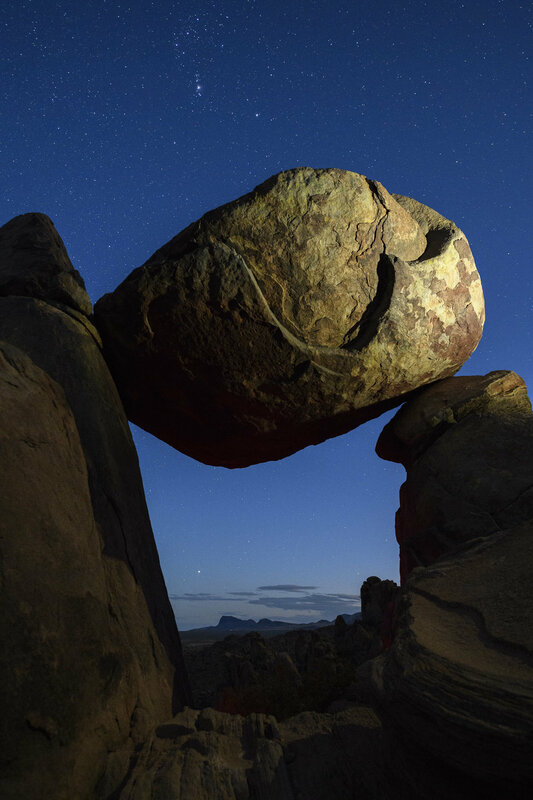 This add-on adventure will occur before the workshop begins to take advantage of the full moon, which provides the perfect nighttime light conditions for photographing and light painting our subjects. The experience will be heavy on scouting and shooting, and light on instruction (though in-field questions are always welcome). Therefore, attendees should have an intermediate level of night photography and light painting knowledge to take full advantage of this opportunity. We hope to push you to step outside your comfort zone—to test the limits of what you and your camera can do. You’ll go home after the workshop with a solid grasp of night photography in a dark and moonlit environments, and a good foundation in light painting techniques. Our locations have generous room to explore, so everyone will be able to spread out and not get in one another’s way. Each participant will have the opportunity to work one-on-one with Chris and Tim in the field. Big Bend is not the easiest national park to get to. But the trip is manageable, and well worth the effort! All the major airports are a fair distance away, but the drive through the desert is spectacular. You will need a rental car. There is no need for four-wheel-drive for the main portion of the workshop, but if you intend to attend the add-on camping trip to Mariscal Mine, you will at least want high clearance. If you are interested in carpooling or sharing a rental car, let us know and we will try to connect you with another student looking for the same. You are responsible for arranging and paying for your own transportation. We will be staying at the Big Bend Casitas in Study Butte (three miles from the west entrance to the national park), where we have reserved the entire complex of casitas. Each casita has a porch, bird-watching garden and kitchenette that includes a sink, small refrigerator and microwave, along with dishes, glasses, utensils, etc. We also have access to outdoor grills in the courtyard. The cost of each casita is $179 per night. You are not required to stay at the official workshop lodging, though doing so does make it easier to meet with the group each morning. Lodging info and group code will be sent after registering. If you are interested in sharing a casita (each has two queen beds), let us know and we will try to connect you with someone like-minded in the group. Study Butte and nearby Terlingua have a few very good and interesting food options, as well as an excellent coffee place. We encourage eating two meals per day—a good breakfast and a great late lunch. When on the night shoots, you may wish to bring snack food or a sandwich and plenty of water. Big Bend is really, really hot in the summer. Which is why we’re holding the workshop in the fall. Expect daytime highs in the 80s, lows in the 60s, and very low humidity. Night temperatures can drop considerably lower, particularly in the Chisos Mountains. October receives a monthly average rainfall of less than an inch, so … well, we’ll keep our fingers crossed anyway. Prudence. Recommended attire: Shorts and short-sleeve shirts for daytime, light pants and long-sleeve shirts for night. A sweatshirt and medium-weight jacket will likely be useful, and a base layer might not be a waste of packing space. Layers are good. Comfortable and protective shoes are recommended for getting around. There won’t be long hikes, but we will be on trails, so quality trails shoes or hiking boots would be optimal. No vigorous activity will be required during the workshop, but please consider your physical abilities prior to registering. There won’t be any long hikes, but there will be trails involved, and you should be comfortable carrying your own equipment over uneven ground in the dark. My first trip to Big Bend—in May 1999—included the hottest day I’ve ever lived. (And I spent a month in the Australian Outback in summer.) The sunset was amazing, but the searing temperatures sapped us of all our energy. We wanted to do little else but stay still and try to breathe. My second trip was better planned. We went in winter, when the Chihuahuan Desert is more temperate and more (let’s be honest) fun to explore. On that second trip, with my friend Steve, we spent more than a week exploring and photographing every corner of the park we could reach. Into canyons. Into backcountry. On trails. On dirt roads. Among trees. Among boulders. Around ruins. Around bends of the Rio Grande. And, oh so often, under very dark desert night skies. The darkness is all-encompassing. The landscape falls in shadow, yet still lives and breathes in front of the camera. The stars overwhelm you. Look closely. Can you see your shadow from the starlight? You might.